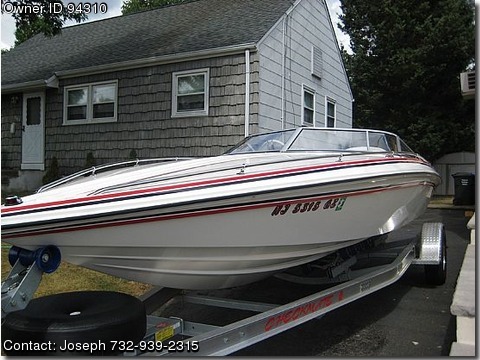 Call Boat Owner Joseph 732-939-2315. Description: 2007 Pulsare 2100 White hull, Red Black Accent stripes, Red Carpet Excellent Condition Inside Out – Boat kept on Trailer, never left in water, washed engine flushed, after every use. 2005 Mercury 300X Offshore 20” Sportmaster Lower Unit 162 Gears 25” Boger Trophy Prop 25 Hours on rebuilt powerhead, including flywheel, fuel injection system, reed valves replaced by Mercury All standard equipment plus • Sea Star Hydraulic Steering WFront mount Cylinder 6345 • Isotta Carlotta white leather wrapped steering wheel • Power lift stern led navigation light • CMC Hydraulic Jack Plate PL65 Black Anodized 5.5” setback with gauge sender • Deck Rails • Mercury Pre Rig controlskill switch, ignition switch, remote oil tank with sender • Ski Tow Pylon • Cockpit Cover Red • Full Mooring Cover Sunbrella RedBlack • Removable Cockpit Carpet Red with black binding • Smartcraft Livorsi Instrumentation System Tachometer, System Speedometer GPS, Water Temp-Link, Water Pressure-Link, Battery-Link, Fuel Level-link, Oil Level-Link, Trim Level-Link.